The Audio-Technica ATR2100-USB and AT2005USB are inexpensive dynamic microphones with dual outputs, both analog (XLR) and digital (USB). Both mics impressed me in our recent shootout of dynamic USB mics. Several readers asked for a direct comparison of these two mics, which differ in price despite sharing specs, capsules, and features. So, we’ve tested these mics head-to-head, recording both simultaneously. Also we’ve compared the analog and digital outputs to see how well the onboard amplifier and ADC compares to outboard gear. 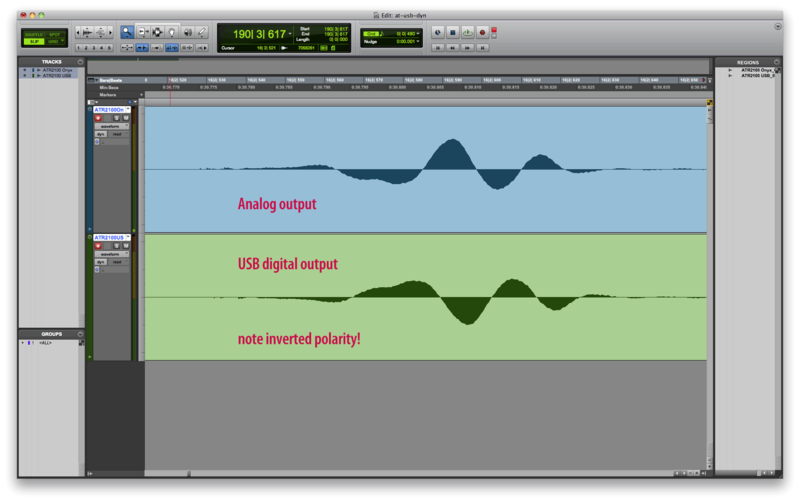 My first task was to get both of the ATR2100-USB’s outputs to show up in Pro Tools simultaneously. I did this via Pro Tools’ “Aggregate I/O” feature. I couldn’t find a way to aggregate my Digi 002 Rack along with the ATR2100’s USB output. But I was able to aggregate my Mackie Onyx Blackjack (a USB mic pre) with the ATR2100. See the setup at right. 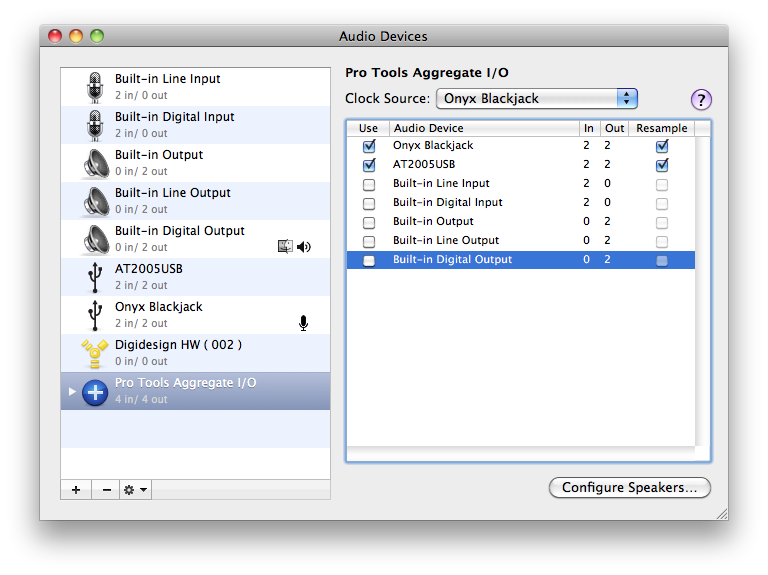 In Pro Tools, I set the “Playback Engine” to this aggregate I/O virtual device. The Blackjack’s 2 inputs showed up as the first two inputs, while the ATR2100 showed up in #3. I put the Blackjack’s analog gain control at about 5:00, just shy of maxed out. Then I used the Sound pref pane to set the USB input’s gain level so that both channels were peaking in the same place in Pro Tools. I got them within 0.5dB of one another. Note that the USB output is a 16-bit device, whereas the Blackjack is a 24-bit device. You can expect to hear a difference in the noise floor of these two channels. The sound quality of these two tracks is very similar. There is more noise in the USB track, as expected. My RTA shows about 5dB more noise above 5kHz, in the USB track. Both tracks are picking up some room noise (my computer fan, mostly), but the USB track has additional hiss above 1kHz. In short, the sound quality of the USB output is decent, and in my opinion the mic in USB mode would work well for podcasting or video voiceover (for screencasts and so on). The actual tone and response of the mic in USB mode is very impressive for the price. For this test, I plugged in both Audio-Technica dynamic USB mics via their included USB cables, and created an aggregate audio device that included both. I recorded to a 24-bit Pro Tools session (although the output of both mics was 16 bit). P-pops and other plosives can be prevented via mic position, speaking technique, and the use of external blast filters. P-pops and other plosives can be removed from an audio track fairly seamlessly by applying a steep low-frequency rolloff, e.g. 12–18dB/octave below 90–150Hz (depending on the frequency range of the voice). For this particular comparison session, I opted to mount an external pop filter (a dual layer mesh unit from Sabra Som), rather than reposition the mics or clean up plosives after tracking. My working distance was about 4 inches, and I tracked both mics simultaneously, which means you’re hearing exactly the same “performance” in every pair of tracks below. The differences between these two mics are subtle. You could punch in one for the other and nobody would notice. I occasionally hear a slightly fuller low-frequency response from the ATR2100-USB. But perhaps I’d swayed a half-inch closer to that mic while speaking, causing a boost in proximity effect? I’ll say it again: I think the differences are so subtle as to be negligible. If you are trying to decide between these two microphones, shop based on features and price, not for sonic distinctions. If you’re wondering why the noise level is so high in the first part of the two proximity test tracks, it is because the signal level (that is, the volume of my voice) is much lower when the I stand farther away from the mic. The three distances in each of those tracks are presented at equal RMS gain, which means the distant tracks had to be turned up much louder… resulting in amplification of the noise floor, too. So long as we’re here, I recorded a few more head-to-head comparisons so you can hear the ATR2100-USB against a couple other microphones you should be considering. These two mics sound pretty similar on my voice. The ATR2100-USB is fuller in the low mids. Both mics need external pop filters (which is no fault of the SM57; to be fair, I should have used an SM58). As mentioned previously, I think the built-in windscreen of the ATR2100-USB is inadequate. This is a really interesting contrast. The LSM is much more restrained on the high end, but sounds a bit eshy. I wouldn’t have expected the dynamic mic to sound brighter than the condenser, but here it does. And I think the ATR2100-USB is giving a more accurate representation of my voice. That’s not to say the LSM doesn’t sound good. It is warmer than the dynamic mic, and while arguably not as accurate on top, is likely to be easier to listen to over long periods. Be aware the LSM is a condenser mic. In general, its high-sensitivity capsule is more likely to pick up mouth sounds and ambient noises from your room than would most dynamic mics. If you’re recording in a noisy space, you’ll be better served by a dynamic mic. But the LSM remains a personal favorite; it won a blind test of inexpensive condensers for podcasting last year, and works well on many acoustic and electric sources. These two tracks were recorded through a two-layer external pop filter, because both of these mics are sensitive to plosives. This is another very revealing comparison: listen to the difference in low-frequency response! The Podcaster sounds high-passed. But now I understand why: it sounds more like a radio voice, pre-EQ’d. This comparison is a bit unfair to the Podcaster, because I stood 4–5 inches from the mic. I know from previous tests that the Podcaster sounds more balanced at closer working distances. Which of these you prefer is entirely subjective. The Podcaster sounds more polished, or arguably thin and scooped. The ATR2100-USB sounds fuller and warmer, or arguably a bit wooly. For low-pitched voices, the ATR2100-USB might want a bit more distance, whereas the Podcaster wants less. Note too that the Podcaster’s street price is $229, or about 4.5 times more than the ATR2100-USB. I stand by my earlier finding, that the ATR2100-USB and AT2005USB are great-sounding mics for the price. If you’re shopping for an inexpensive podcasting solution, both of these mics should be on your shortlist. Thanks to their dual-output design, both mics will retain their utility when you expand your podcasting rig to include an external preamp/interface. Kudos to Audio-Technica for introducing useful audio tools at these remarkable price points! The Rode Podcaster and both Audio-Technica microphones were loaned to me by their respective manufacturers for the purposes of this review. The LSM, SM57, Onyx Blackjack, and other gear mentioned herein are personal property. We received no compensation from Mackie, Shure, Studio Projects, Rode, or Audio-Technica for this review. I was surprised how similar the 57 and the 2100 behaved on your voice. No wonder these things are so popular with podcasters. The USB noise is unpleasant, but for something simple like a screencast/podcast/simple narration, it’d do the trick. Well, after your shoot out, previous to this post, I bought the ATR2100. Hate the USB output, but this mic sounds sweet via XLR! For $34.99, the best value to add to any mic locker, especially when it comes with stand, USB and XLR cables. At the AT2100-USB vs AT2005USB sound samples (narration and proximity), why did you choose to use the USB output of one of the mics while analogue output for the other? Or did I miss something? @Euclio, the samples were labeled incorrectly. In the head-to-head test, I used the USB outputs for both Audio-Technica mics. I have corrected the labels. Thank you for pointing out the error. Would have been nice to hear them from just a few inches further away- I think maybe we are still getting a bit of proximity effect . Also would help with the plosives (as well as mic technique. BTW every time I click on a sample, there is a delay, and then it tries to play two samples simultaneously. Is that just on my system (I am using Firefox), or…? Great set of tests, thanks! I have an ATR210 and have been frustrated trying to get good input levels via USB on my Mac (OSX Mountain Lion). Speaking in a normal, podcasty, male voice with my mouth 3-4 inches from the mic and all volume sliders set to max, I see OSX and Garageband meter levels reaching only about 30%. Also, if I plug a headphone into the ATR2100 1/8″ jack, it is pretty much useless for self-monitoring. Not loud enough really to hear myself effectively. I’m curious if you could confirm both of those issues with your mic? Perhaps I have a defective one? Matt, this is really a great review, I’ve been playing around with some dynamics and cheap condensers (sm57, atr2100, e815, at2020, c01) for my not so optimal recording space (air conditioner, electronics, etc) and found that dynamics are the ones that give me the less room noise and an acceptable quality. Condensers have a really nice sound to them, but in my case need a lot of noise reduction. But a question just pop in my mind, would this be the same with lets say a handheld condenser? I purchased today an e835 since for my voice sounds brighter thant the sm57 I own, and needs bit less gain, and remember on the store seeing an audiotechnica at2010 handheld condenser on display, basicaly at the same price. So what about it? would the results be the same as with my other condensers? or does the different form factor helps with the room noise?? thanks and great work with your data base. @Jorge, in general you’ll find that condensers hear more of the room because they have higher sensitivity than dynamics. The issue is not form factor so much as sensitivity. Also, condensers have active electronics which contribute noise. And finally, small-diaphragm condensers tend to have higher levels of self-noise than large-diaphragm condensers. thanks a lot for your answer, I was afraid you’ll say that, but the e835 sounds great on my voice, it’s really amazing the difference when using a dynamic in a noisy environment, listened to an interview in a podcast recently about your article and your data base and I really enjoyed it, and about this article, the atr2100 is really a great option for a budget podcaster, only had mine for about half a year but the sound is really good, specially via xlr, but for someone that’s just beginning and have no mixer, having the usb alternative without beign a condenser and also at such a price is a blessing, tested the atr2005, but like you don’t think there is much a difference besides the looks. thanks again for the time you take with all this, I know like me a lot of folks really appreciate it. Hi, I came across this posts while searching for the Heil PR40 – I am intrigued by the sound quality of the Audio Technica ATR2100 for the cost. I find it hard to even tell the difference between the two when listening blind.. the Audio Technica ATR2100 even sounds brighter with the bonus of XLR and USB connectivity..
On that note why should I pay out for a £250+ microphone when I can pay out £70 for the ATR2100? 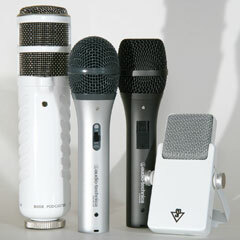 I previously contacte AT about the differences between these mics. The only difference noted was the color and the clips that could be used. The 2005 is more “professional” in its color, and it could be mounted in a “normal” clip. Great comparisons, I agree the USB noise from the ATR 2100 is annoying, but very easy to get rid of. Mic can’t be beat for the price, you can find the new on EBAY for 35 40. Hey I am experiencing same problem as Jeff Waters .Whenever i connect my atr2100 via USB to my pc i get realy low input.I’ve adjusted every sound level even then m getting this low input voice.Please tell if any additional drivers to b installed or something. Nice man, but the background noise and hiss u speak of isn’t really that noticeable at all on the at2005 and it sounds damn good. Even far away at 10 inches it’s pretty nice, you start to hear the background noise a little but really bad at all. Matthew, I really appreciate the time you take out to do these comparisons. I’ve checked this one out as well as your ultimate mic shootout with the RE20, PR40, etc. These are extremely helpful especially for people like me who stressed over this stuff when trying to pick the “right” microphone. I too agree that for the money, it really sounds like the ATR 2100 is extremely hard to beat – for someone who doesn’t have any XLR equipment, this microphone makes a lot of sense. Me and a couple of friends started a podcast, and for any type of remote Skype/Google Hangout conversations, the ATR 2100 was our budget go-to choice. Thanks a million for taking the time to put these quality comparisons together. Thanks for posting this. I thought I’d add my experience about the AT2100 (and most other USB mics I’ve tested) not having enough “gain” or loudness in Windows. I didn’t have any problems with Windows XP, but in Win 7, 8 and 10 I can YELL into the mic from just a few inches away (with everything cranked up all the way) and barely get enough noise. Haven’t been able to find any drivers/ etc – that solve the issue. I ended up getting the Blue Yeti USB mic specifically because it has a “Gain” control. It’s one of the few USB mics I’ve tested that is “loud enough” to be useful. (Another one is the Samson GoMic – an incredible mic for the price). Anyway, I didn’t want to sell the AT2100 just because it wouldn’t work on any of my computers. Also, as my audio gear collection got bigger (Tascam 70D 4-channel recorder, etc), I decided to spring for the Onyx Blackjack 2×2 USB Recording Interface. As is Matthew’s experience, I’ve had to crank the gain up on the BlackJack almost all the way. But I DO get a signal that is very usable in my PC. And the sound is very, very good. The Atr2100 is great when it works. Only thing I’m missing now is a new driver for the new OS 10.10.05 update. My computer won’t recognize it now, I may need to go get another USB mic.